Microplastic fibre inside sea pen polyp. Researchers from the universities of Bristol and Oxford, working on the Royal Research Ship (RRS) James Cook at two sites, have now found evidence of microbeads inside creatures at depths of between 300m and 1800m. This is the first time microplastics — which can enter the sea via the washing of clothes made from synthetic fabrics or from fishing line nets — have been shown to have been ingested by animals at such depth. Among the plastics found inside deep-sea animals in this research were polyester, nylon and acrylic. 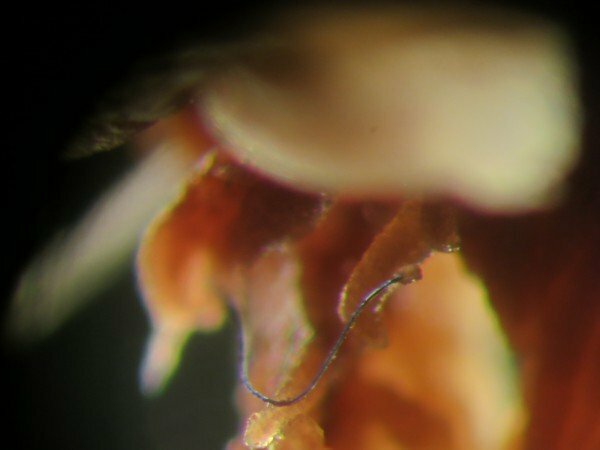 Microplastics are roughly the same size as ‘marine snow’ — the shower of organic material that falls from upper waters to the deep ocean and which many deep-sea creatures feed on. Web Source: University of Bristol.